THE BETTER YOU WIPEOUT THE MORE YOU WIN.. WIPING OUT WITH A DIFFERENCE! HOW BIG CAN YOU WIPEOUT? A THRILLING SURFING THEMED GAME SHOW TO HIT THE CLUB INDUSTRY. THE BIGGER YOU WIPEOUT SURFING THROUGH THE GAME SHOW THE MORE YOU WIN... IT REALLY IS THAT SIMPLE! ATTRACT A YOUNGER CROWD TO YOUR VENUE WITH THIS APPEALING PROMOTION ALTHOUGH MY BET IS THE NOT SO YOUTHFUL WILL LOVE IT JUST AS MUCH! SOMETHING PURELY SIMPLISTIC ABOUT THIS GAME SHOW PROMOTION THAT ATTRACTS A CROWD - SO YOU KNOW YOU'VE PICKED A WINNER WHEN YOUR MEMBERS ARE COMING BACK WEEK AFTER WEEK TO WIPEOUT & WIN! 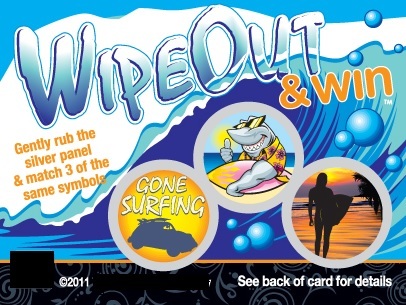 WIPEOUT & WIN SCRATCH CARDS ARE HANDED OUT FOR A SELECTED PAY ON YOUR POKER MACHINES, PLAYERS CAN WIN INSTANT PRIZES OR GO IN THE DRAW TO PLAY THE 'WIPEOUT & WIN' GAME SHOW SEGMENT. UTILISING SCRATCH CARDS IN YOUR VENUE IS THE EASIER & MOST COST EFFECTIVE WAY TO RAISE YOUR BOTTOM LINE!